There is a fairly large number of technological options for carrying out facade finishing works. The construction market offers materials for every taste, wealth and for every need. In this article we will explain how to make the facade plaster with your own hands, consider the composition, as well as show photos and video instructions on the facade plaster. Facade plaster is a finishing material applied to the external surfaces of the walls of a building, the main purpose of which is not only decorative finishing, but also their protection from various influences. Mineral-based plaster. This type of facade plaster can be considered the most economical, as it is created on the basis of simple cement with the addition of various fillers designed to impart water-repellent properties to the composition. This coating will be of high strength, but the choice of colors of plaster is limited. Acrylic plaster. The next type of facade plaster, which is characterized by high plasticity, ease of application and resistance to temperature changes. Due to the special structure of the material, you can create a coating of almost any texture, which, combined with a wide color gamut, allows you to choose the right shade for any design solution. Silicate plaster. This type of finishing coating has good adhesion with porous surfaces, therefore, if there is a need to finish a building made of gas silicate blocks, this option will be the most appropriate. In addition, this plaster is resistant to pollution, which is a positive thing if the house is located next to the road. 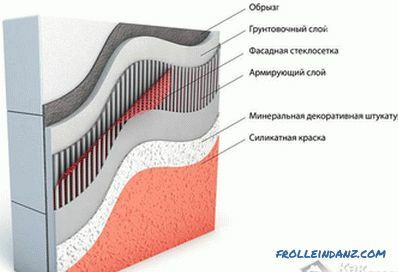 Silicone facade plaster. 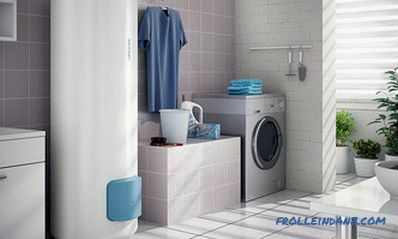 Combines the properties of all other options, which allows us to speak about the universality of its application. 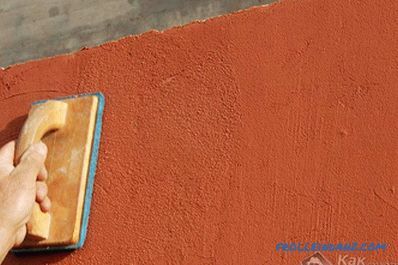 This type of material has good adhesion with almost all surfaces, it is resistant to external influences, allows the walls to breathe and, thanks to a variety of colors, can be used in almost all cases. One of the few disadvantages of this type of plaster can be considered only its relatively high price. The choice of a specific type of plaster for the facade should be made depending on the specific tasks and financial situation. 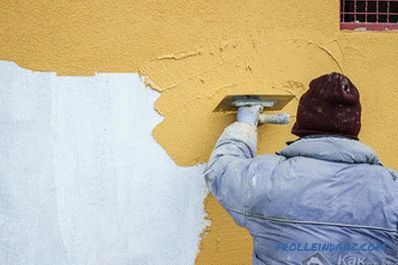 In order to understand how to make an external coating for the walls of a building with the help of facade plaster, it is necessary to consider in detail all stages of the work. Conduct them should be consistent. As always, the work should be start with preparation. 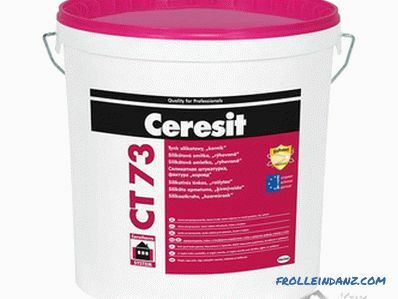 In this case we are talking about the dismantling of the old coating, or the maximum cleaning of surfaces, if we are talking about a new building. 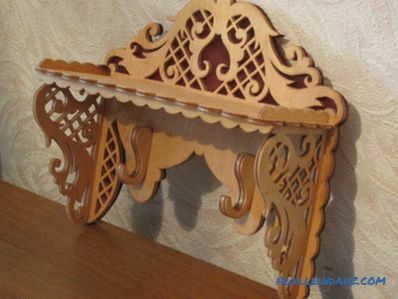 It is necessary to remove all the elements of decor and protection, such as window sills, drainpipes or hanging lamps. The surface to be applied to the plaster should be as flat as possible. 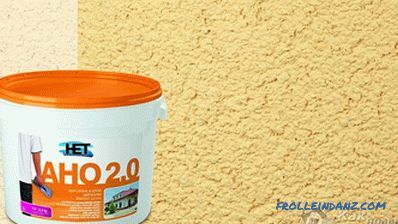 If there are plane drops more than 1.5 mm per square meter, then it is necessary to apply a layer of leveling compound. 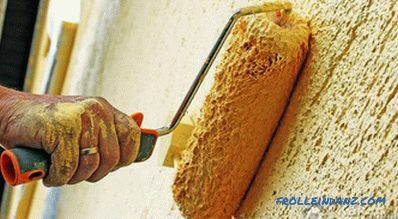 After it hardens and dries, the walls are covered with priming compositions, which are necessary to increase the adhesion between the leveling and decorative layers of the finish. After preparing the surface, you can proceed to the preparation of the mixture. There is nothing difficult here - you just need to follow the attached instructions, however, no violations of technology are unacceptable, as they will lead to changes in the characteristics of the composition. It is worth noting that the market can often be found and ready-made versions of the mixtures, which only need to add the required amount of water and mix thoroughly. The next stage of work is the direct application composition on the wall. It is important to know that the work can be carried out both completely manually and using special equipment. The plaster is applied in several layers. 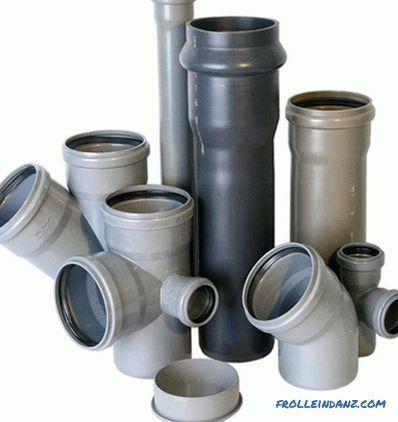 The thickness of the applied layer depends on the grain size of the filler and ranges from 8 to 17 mm. The next layer can be applied only after the previous one has completely dried. 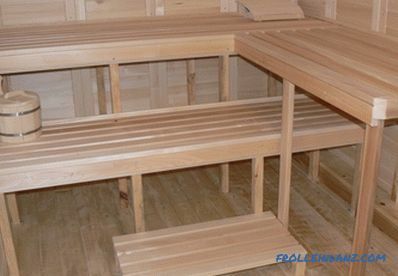 Therefore, it is advisable to bring the finishing work of this type at a temperature in the range from +5 to + 25ºC and a normal level of air humidity. After the last layer of plaster has been applied and a little “grasping” you can create the necessary texture with the help of a special tool or, on the contrary, wipe it, resulting in a completely smooth surface. 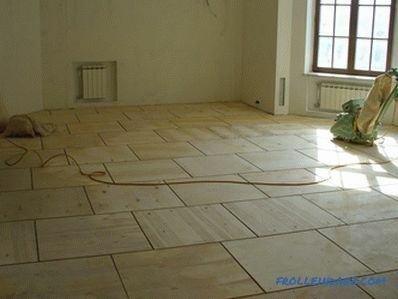 In this description of the main steps of applying a finishing material can be considered complete. Decorative plaster is quite simple in work, and therefore its independent use is quite possible if you have basic skills to perform this type of work.